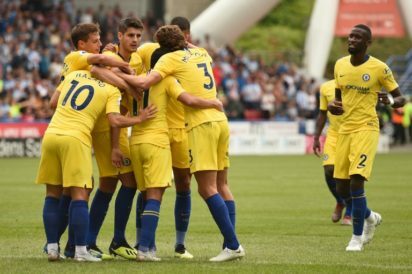 Chelsea’s Spanish midfielder Pedro celebrates with teammates after scoring the team’s third goal past Huddersfield Town’s English goalkeeper Ben Hamer during the English Premier League football match between Huddersfield Town and Chelsea at the John Smith’s stadium in Huddersfield, northern England on August 11, 2018. Watford, Bournemouth and Crystal Palace also picked up 2-0 wins on the opening weekend of the season. Chelsea have endured a turbulent pre-season with Sarri sworn in to replace fellow Italian Antonio Conte less than a month before the campaign got underway.